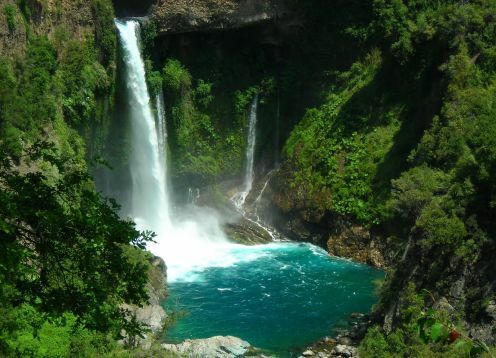 The National Park Conguillío is in the province of Cautín, communes of Melipeuco and Vilcún, and in the province of Malleco, communes of Curacautín and Lonquimay. It covers an area of ​​60,833 ha of the Andes Mountain Range. It is accessed by road Cajón-Vilcún.Cherquenco, asphalted from Cajón to Cherquenco, gravel, passable all year round, except snow days, so you must use chains and double traction. By Victoria-Curacautín, asphalted road to Curacautín, the rest gravel, passable all the year to Captrén nursery, depending on the accumulation of snow, the rest is only passable in summer, from November to March. 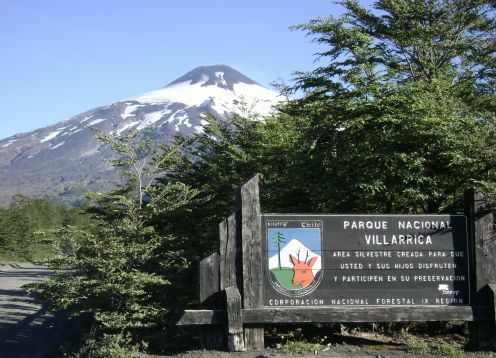 You can also access this sector to the entrance of the Park via Lautaro-Curacautín, to Curacautín, the rest gravel in good condition; then it continues calaminoso until the house of control, approximately 8 km. The sector lagoon Rainbow is located, to 5 km. from the Visitor Center, 1 km. from Lake Captrén and 12 from the Truful-Truful nursery. Serves visitors from November to June, due to weather conditions. During the summer period, the Administration moves to the Los Uguas sector. The latter is located 3 km away. from the Lanlán sector, 45 km. of the Captrén nursery. Truful-Truful: 2 km. from the entrance to the Park, and 12 from the Arcoiris administration, 17 km. from the Visitor Center and 12 from Melipeuco. It attends all the year. The Umbrellas: 3 km. of the entrance and to 45 of the Rainbow Administration. The public attention is made throughout the year. Caseta Captrén: 11 km. of the entrance to the Park and 10 of the Rainbow Administration. Public attention is made only from November to March, from Monday to Sunday, throughout the day. Visitor center to Captrén nursery school: (10 km.) To Truful-Truful, 17 km. to the Administration, 5 km. Public attention is only made during the summer period (December to March). La Caseta: It is located 3 km. of the Rainbow Administration. There are 12 places with a large bathroom. For the sites they have water, (not electric light), trash, shower (hot and cold water) and a stove. Each site is delimited, has parking and natural shade. In good state. El Estero: It is located 5 km. of the Administration, are 10 sites, have toilets, hot and cold water, a dump and electric light. With natural shadow In good state. Los Ñirres: It is located 5 km. of the Administration, there are 44 sites with 3 toilets, hot and cold water, a shed, electric light and 5 pylons for water, with parking, fire pit, all with natural shade and delimited sites. In good state. El Hoyón: It is located 2 km. Administration, are 10 sites with dumpster per site, 1 fire place, large bathroom (with shower, bathrooms for men and women and sink for washing), without light, common parking and natural shade. In good state. These 88 sites are in concession, also having cafeteria-pulpería, first aid, bakeries and boats for rent. The concession opens on December 8 and closes in April of the following year, which depends on weather conditions. For more information, call 45-841710 or the CONAF IX region office (Temuco), phone 45-298100 or 298210. 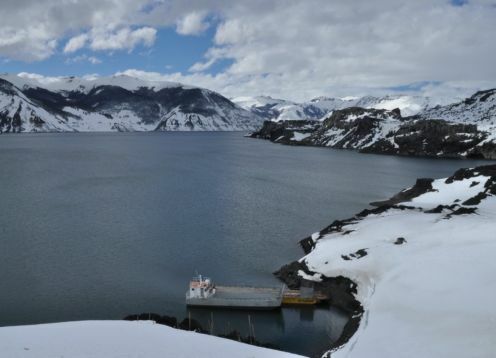 In addition, in Captrén there is a camping area with 8 sites with toilets and cold water, parking, control booth and information and hiking trails. 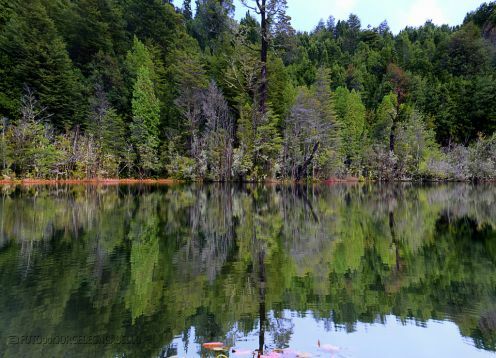 It is located on the south shore of the Laguna Captrén, 10 km. of the Administration, in the northeast access of the Park. Extension: 10 km. Travel time: 5 hours round trip from Playa Linda. 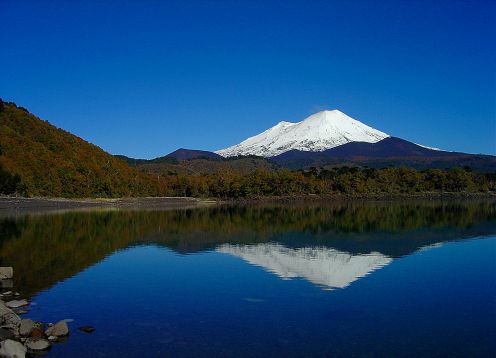 During the tour, there are several forest types according to altitude, glaciers, Lake Conguillío and Llaima volcano. Its objective is the appreciation of scenic beauty, guided by interpreter twice a week. Suitable for young people and adults, but not for extreme ages. Extension: 6 km Departure from Visitor Center. Travel time: 5 hours round trip, is done with park ranger interpreter once a week. 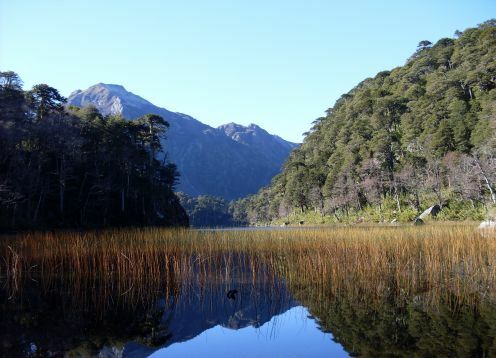 Characteristics: The path moves between forests of coigue-araucaria and lenga, accessing the Captrén lagoon, rich in birdlife. Suitable for all people without physical impediments. Extension: 22 km. Travel time: 4 hours and 30 minutes one way. It is born in the Visitors Center and it concludes in the canyon of the same name. It is done only in a vehicle. It allows to know the Casa de Colono, the Rainbow Lagoon, the Valley of the Moon and Las Vertientes (where water emerges from lakes). Suitable for adult family groups, youth and children. Extension: 900 m Travel time: 2 hours and 30 minutes round trip. It is born in the Visitors Center and ends in the same place. It is exclusive for children (from 5 to 14 years old). Teach to discover what grafts are and their function. They are guided by a guard-interpreter. 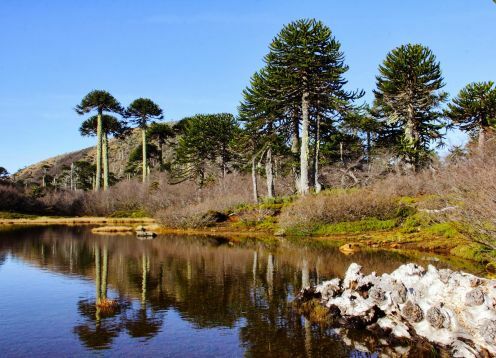 It goes through mixed environments of araucaria and ñirre. Extension 1.2 km. Travel time: 2 hours and 30 minutes round trip. It is born in the Visitors Center and ends in the same place. It is exclusive for children and its objective is to show the crater and its function. Extension: 700 m Travel time: 2 hours and 30 minutes round trip. Born in the Visitor Center. Its objective is to make known the slag field and the influence of the volcano as a landscape modifying agent. It is also for children. The forest of araucaria-ñirre-coigue and araucaria-lenga is crossed. Extension: 1.8 km. Travel time: 2 hours and 50 minutes round trip. It is born in the Visitors Center and ends in the same place. It is exclusive for children. 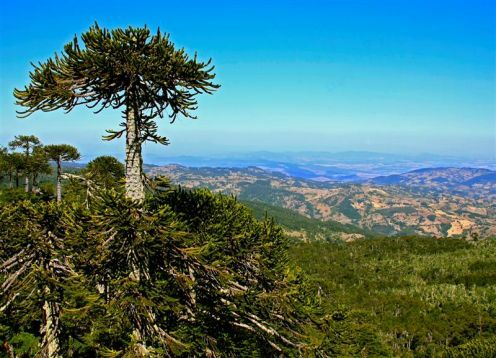 It allows to know the oldest specimen of araucaria. They go through forests of coigue-araucarias-ñirre and lenga-araucaria. Extension: 250 m (vehicular parking exits on the side of the main road). Travel time: 20 minutes. Self-guided with 5 numbered stations. Llaima Volcano and Lan-Lan Falls. Tour of 1200 m. Travel time: 1 hour and 20 minutes, round trip. Characteristics: Implemented with 13 explanatory panels and a viewpoint, the path passes through an araucaria forest. Suitable for all public without restriction. 800 m route Travel time: 1 hour trip (round trip). Characteristics: Implemented with 5 interpretive panels. During the journey you will visit a series of guide courses that originate underground to follow the period of the year. Suitable for all ages. Tour of 900 m. Departure from Truful-Truful control booth. Travel time: 1 hour round trip. Characteristics: Self-guided tour with 3 interpretive panels, the geological formation of this sector of the Park caused by water erosion is presented. Suitable for all ages. Flora: The park has a varied and unique flora in Chile and the world due to the existence of the great araucaria and coigües forests that remind us of the dinosaurs among the flora there are: Araucaria - Ciprés de la Cordillera - Coihue - Lleuque - Quilmay - Canelo Dwarf - Palmilla.